I have been talking a lot in my recent posts about this new fangled contraption that I’ve recently added to my kitchen collection. You’ve been talking about it, too, in the comments, because you’re on point with everything, you guys. This mysterious thing we’ve been speaking of is called a SPIRALIZER. Here’s the thing about me and a spiralizer. First, when I thought about the concept of a machine that would take up kitchen space just to make noodles out of vegetables, I got kind of annoyed. Why would I want another thing to clutter up my kitchen cabinets which are already packed to the brim with stuff because my whole food blog operation exists out of a teeny-tiny kitchen with minimal storage? Yeah, not happening. But then I caved. Peer pressure. I’m weak and I want to be like the cool kids and I got one. Correction: I got, like, five. I was bound and determined to find out if these things were actually as wonderful as the foodie section of the interwebs was claiming them to be, and if so, which one was really worth the precious kitchen cabinet space. And as much I hate to admit that I might have been wrong, I have to tell you the truth: after playing with a variety of spiralizers for a few months, I am here to tell you that these little gizmo-doodles are just super super super fun. Not to mention HEALTHY. I mean, if you don’t feel something warm and fuzzy inside when you watch a sweet potato turn into tiny little spirals (and then proceed to EAT said tiny little spirals covered in, oh, I don’t know, CASHEW CREAM SAUCE? ), I don’t know why we’re friends. With that, I’m going to let you jump right into the video where I’ll tell you the one spiralizer you should never-ever-ever buy + two spiralizers that I would consider winners. 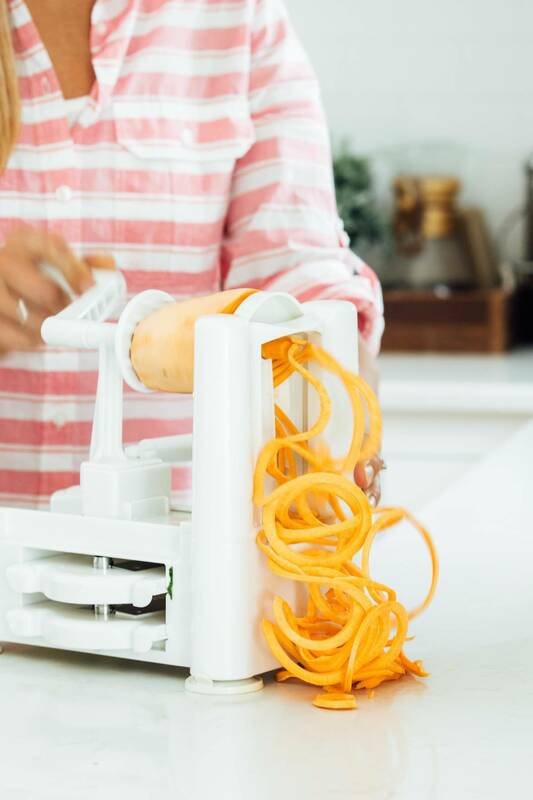 If you have never seen a spiralizer in action before, you are in for a treat. The two brands that I used as an example in the video were the Müeller and the Paderno. Here are some notes on each one just to recap the video. The Müeller spiralizer has a 4.5 star rating from 200+ reviews on Amazon. The Paderno spiralizer has a 4.5 star rating from 6,000+ reviews on Amazon. If I had to recommend one for a beginner, I think I might actually recommend the Müeller – it was just really easy to use. That being said, the Paderno is very popular for a reason. It is kind of the “classic spiralizer” that most people know and love. I liked the Paderno especially because of how neatly it stacks together for storage. Either one of these two spiralizers will be a win. 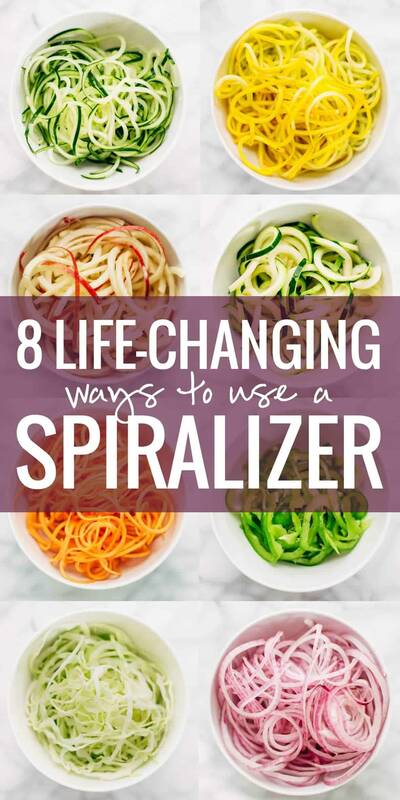 with 8 life-changing ways to use a spiralizer! 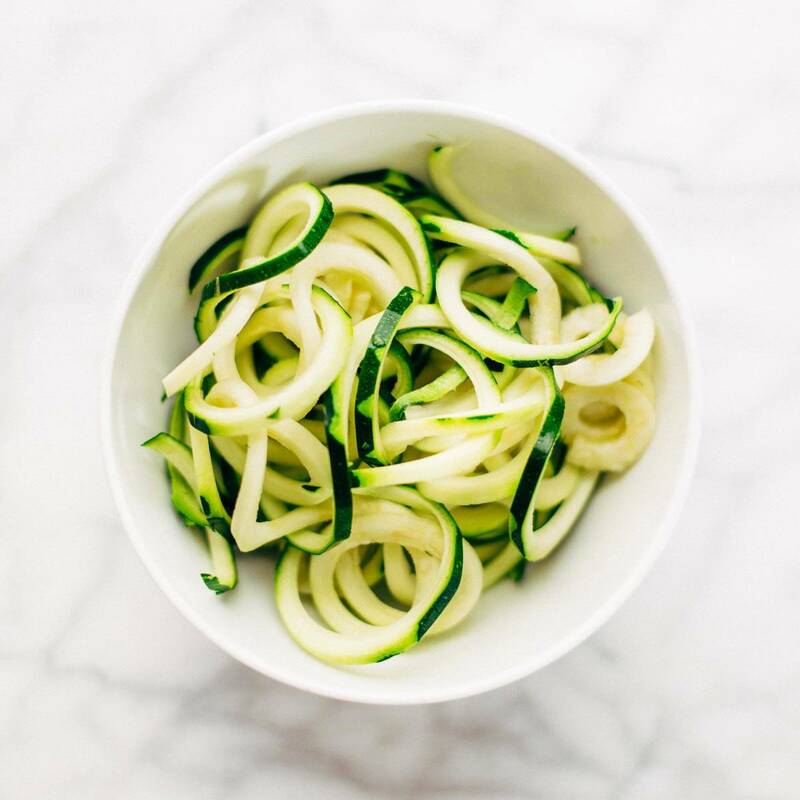 How to spiralize it: Oh, zucchini! The classic vegetable for the spiralizing peeps worldwide. I like to use the small or medium blade for zucchini, and I find it easiest to cut the zucchini in half first (see video). Cooked or raw both work – these little guys are yummy and versatile! Recipes: 4 Ingredient Creamy Vodka Steak Pasta <– or — >15 Minute Spicy Shrimp with Pesto Noodles – both yummy! Recipes: Rainbow Vegetarian Pad Thai because, honestly, PAD THAI! Yelling necessary. Recipes: My sweet friend Gina from Skinnytaste has just the thing for you: Spiralized Apple and Cabbage Slaw! Recipes: Creamy Spinach Sweet Potato Noodles with Cashew Sauce – yes. There it is. Recipes: Rainbow Power Salad with Roasted Chickpeas 💝 enough said. Recipes: Spiralized Cabbage with Zucchini and Almonds – super creative combo from Ali of the famous Inspiralized blog! How to spiralize it: Onions are super easy to spiralize – who knew?! Just use a flat blade since the onions are already layered by nature, and two seconds later, you’ll have a pile of thinly sliced rings that are perfect for a whole variety of uses. 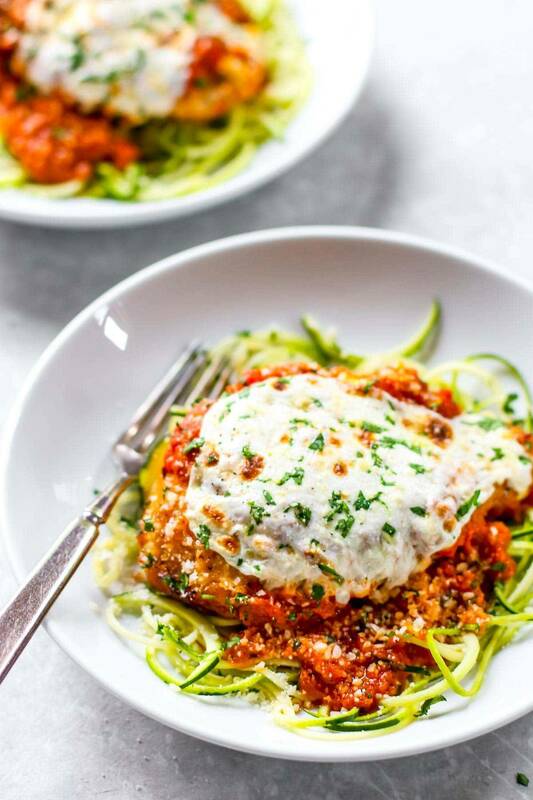 Recipes: 20 Minute Healthy Chicken Parmesan for the win! 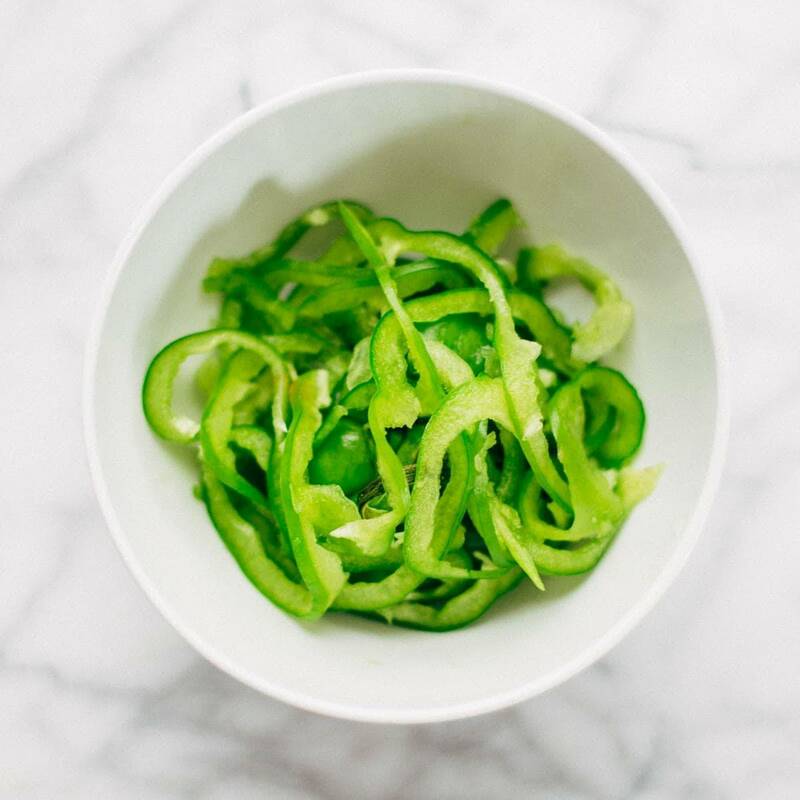 Here are the spiralizer recipes I am loving lately! Of course, you can get both of these spiralizers on our beloved Amazon (here for the Müeller, and here for the Paderno), which, hopefully you have set up with Prime so that you can get two day shipping for free? Anyone else out there Prime-obsessed? Otherwise I think you can get these at speciality food stores, like maybe a Williams & Sonoma type situation? I have yet to see them at “regular” stores like Target, so in my internet-and-free-two-day-shipping-loving humble opinion, you might be best off ordering online. Disclaimer: the links in this post for both the Müeller Spiralizer and the Paderno Spiralizer are Amazon affiliate links. If you have anything to add to this list, let’s hear it! I know that there are zillions of creative ways to use the spiralizer and I’m hereby enlisting your expertise. Leave a comment with your ideas! I keep seeing recipes that use this and I am intrigued. I better make room on the cupboard. :). I’m pretty much going to have to get one after seeing those apple spirals. I mean, come on! The yummy possibilities! VERY excited about this post!!!! Can’t wait to get one and make some of these recipes! Love your blog! What?! No tip from Bjork to look toward for the end of the video?! Sacrilege. Hi Lindsey, I felt exactly the same way about the spiralizer taking up space, as I too blog from my kitchen and I’m a notorious collector of kitchen instruments, utensils and paraphernalia, ‘a habit I’m trying to break”, But I caved as well. The upside is I love it and use it a lot, its been tremendous fun experimenting with and my vegetable intake has increased dramatically. Great Blog. Thank you! Seriously; you win the award for best informative (and beautifully colorful) blog post causing people to go buy a spiralizer! Like many before have mentioned I have not taken the leap yet but I am ready to jump Now. Excited to get mine and try your wonderful recipes. Thanks! make Zucchini and Shrimp pesto tomorrow!! Thanks! I have the Paderno and LOVE it. We make all sorts of things with it including baked curly sweet potato fries with it. But the best part about the Paderno?? Dishwasher safe!! I recently bought a small hand held spiralizer made by “Very Healthy.” I really don’t have alot of storage so small is what I needed. I love it. It does zucchini perfectly, carrorts, really anything. I like how small it is, and the price. Hi Lindsay, love that you’re doing videos now. How clean is your kitchen!! OK I have a confession – I’ve had a spiraliser for several years now and it’s been lurking at the back of my cupboard feeling unloved. I totally need to get it out again. Courgettes (zucchini) were always my go-to veg for spiralising, but you’ve given me lots more great ideas here. Loved how those sweet potatoes turned out. Thanks! I’m sold! All of your recipes and suggestions look too delicious to pass up on! Thanks for the post! Ive been wanting to get one for a while & this helped me choose! Wondering if you’ve tried freezing the zoodles? We have so much zucchini in our garden this year & can’t eat it all to keep up with it! Thanks! Spiralizing apples is something I never thought to do! Thanks so much for the reviews Lindsay! Being frugal (some would say cheap!) I could not help but wonder what you did with the “scraps” , the ends you cut off, and the core. When I looked at the apple I wondered how you kept it looking so nice and white (fresh). When I do apples they seem to turn brown the instant I slice them. Your blog is interesting. Thank you. Great tip to keep apples from turning brown after peeling/cutting is to sock it input salt water. Not really have to be very salty. Say half tea spoon with a full cup of water. Soak it for less than a minute and yes, the apple will not turn brown! Great ideas for using the spiralizer! I love the product recommendations too! Bless you for this post. I can hardly wait to have a bit of extra money to order a spiralizer. I’ve tried a couple of the hand-held spiralizers – the one that Lindsay showed, a potato peeler with a julienne blade, and a cheap knock-off of the Betty Bossi spiralizer. Like the one that Lindsay showed, that one was rubbish (that and the the knock-off one were bought on one of the daily deal shopping sites). The potato peeler version is good and would do in a pinch, but it is a bit limited. I ended up getting the proper version of the Betty Bossi one, and it’s brilliant – super easy to use and if you have limited kitchen space, this is a great option. I’ve used it for zucchini, potato (kipfler potatoes work best), carrot. Next on the list is the sweet potato and beetroot! Such a helpful post. Thanks, Lindsay! I need to get myself a spiralizer! I borrowed my friends once and fell in love with it. Since I’m currently travelling the world it does make it quite difficult to purchase many appliances as I’m on the move – currently in Bali!